I was born in Syracuse, New York. I went to high school at Sherburne-Earlville HS where I graduated in 1993. Then I moved to go to College at SUNY Morrisville for Computer Science. I went there for two years and then transferred up to SUNY Tech at Utica/Rome in 1995. During that semester I started to question if I was in the right major and was getting a bit tired of the School Environment. I needed a break from things for a while. So I took two years off and lived in various places and held various odd jobs like working at Little Caesars and Ames department store. During that two year period I lived with my dad, my mom and a friend out in Murfreesboro, Tennessee. 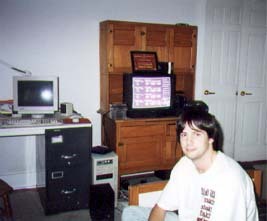 In January 1998 I finally got back to College. I had talked to one of my art teachers from high school and he recommended the Art Institute of Pittsburgh (AIP) to me. At first I was thinking of majoring in Computer Animation but after looking into it I discovered I would have to do a lot of drawing by hand and my drawing skills aren't that great. So I opted to major in Multimedia instead. I graduated from the Art Institute of Pittsburgh in September 1999 and started working for Lockheed Martin in October that year. The fact that I had an internship at US Airways for about one year helped me to get a job so soon after graduation. At US Airways I created computer based training programs for pilots. This was taken while I lived in Pittsburgh in Squirrel Hill while going to AIP. Mt. Laurel, NJ shortly before I moved to Ballston Spa, New York to work at KAPL. When I started at Lockheed Martin I was at their New Jersey site in Mt. Laurel. I created computer based training programs for the repair and maintenance of computer systems aboard Navy ships while I was in Mt. Laurel. One year after I started there I transferred up to Knolls Atomic Power Laboratory (KAPL). At KAPL I still created computer based training programs, but I was working on stuff for nuclear subs. While I had the internship at US Airways I got a few free round trip tickets to anywhere within the US. I got a total of five free trips during the year I worked there. I used my first trip to visit my sister Becky in Napa, CA. For my second trip I visited my Dad and Rani out in San Diego, CA. I had a great time there and went to Mexico for the first time in my life. 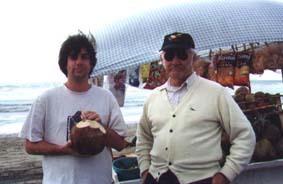 My dad and I on a beach in Rosarito, Mexico from my trip to San Diego, CA. The ocean scenes for the movie Titanic were filmed here. I used my third ticket to visit my old college roommate from SUNY Morrisville. He lived in Oklahoma City at the time. I went out there for two weeks after I graduated from AIP and before starting at Lockheed Martin. I used my last two tickets shortly after I started at Lockheed Martin in December of 1999 and in January of 2000 to visit my dad while he was staying with Aunt Beulah in Kissimmee, Florida. 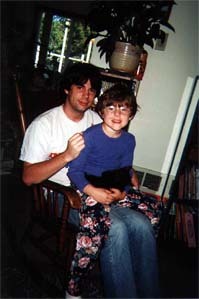 My sister Becky passed away in January 2000 from cancer. After she passed away I got in touch with my other sister Diana. The last time I had seen her was when I was 2 years old. I did not have any memories of that. After talking to her for several months on ICQ and on the phone I decided I wanted to fly out to Portland, OR to meet her. I had a wonderful time during the week while I was there. My sister and I got along great. I also enjoyed meeting two of my nieces for the first time. My niece Laura and I at my sisters house in Portland, OR. 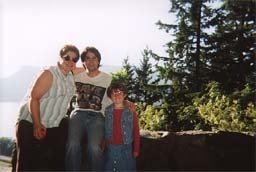 My Sister Diana, Laura and I went to Multnomah Falls about 45 minuets from her house in Portland. 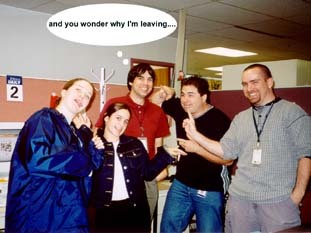 I left KAPL in January 2002 to move to Portland, Oregon. Check out the link below to get more information on that trip.